After another very busy stateside séjour, we are back in Antibes, where the pace is not quite so hectic. We had time for a leisurely stroll around town today, where we came across another painting, like the ones we noticed about the same time last year. We found this one in the square in front of our apartment. 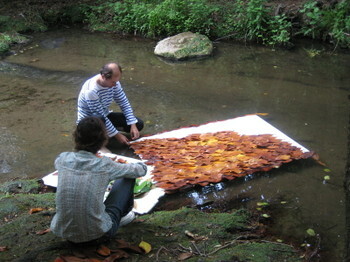 It's one of ten reproductions of paintings done by artists inspired by the French Riviera. 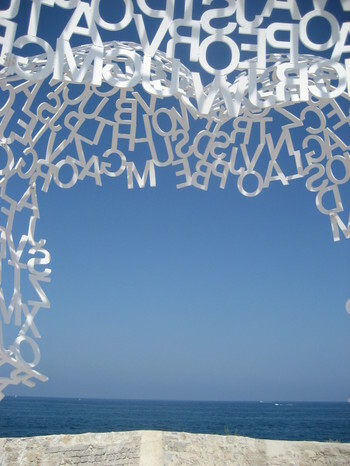 This permanent exhibit, called la "Côte d'Azur des Peintres" (the French Riviera of the Artists), is scattered all around town thanks to the contribution of the Conseil Régional Provence Alpes Côte d'Azur in collaboration with the Conseil Général des Alpes-Maritimes and the city of Antibes. The ones we've seen so far seem to be placed strategically in front of the actual landscapes that are represented in the paintings. 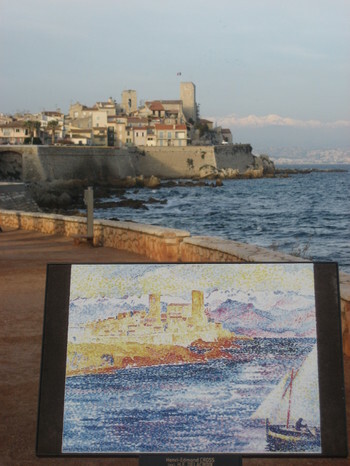 In this one, called "Antibes", painted by Henri-Edmond Cross in 1908, nothing seems to have changed, except maybe some erosion of the rocks in front of the ramparts. It wouldn't look too much different if he painted it today. Other nearby cities on the Côte d'Azur are also participating in this exhibit, including Cagnes-sur-Mer, Le Cannet, Saint-Paul-de-Vence, and Villefranche-sur-Mer. 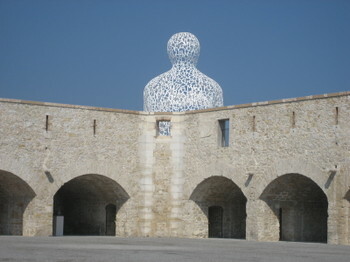 Officially inaugurated on March 25, 2007, the newly renovated Bastion Saint-Jaume in Antibes is quite eye-catching at the moment. Originally conceived in the 1700s, this ancient naval site, along with the port, was destroyed by bombing in 1944 by the Germans at the time of their departure, and then rebuilt a few years later. 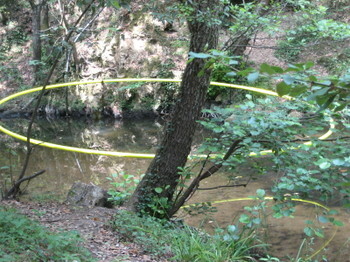 All naval activities at the site ceased in 1985. 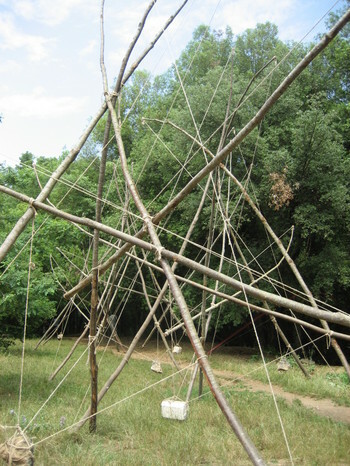 And now this new space will be used to welcome some of the traditional cultural activities that take place each year here in Antibes, such as the Voiles d’Antibes, the Village Saint-Pierre, etc. 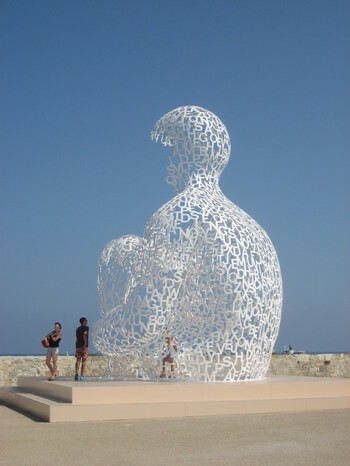 Can it be a coincidence that the artist’s name is “Jaume” Plensa and the sculpture is installed at Bastion Saint-“Jaume” ?? For our first weekend back in France, after a busy five-week stateside hiatus, we got to peruse some interesting artwork and soak up some rays in the beautiful outdoors at the same time. 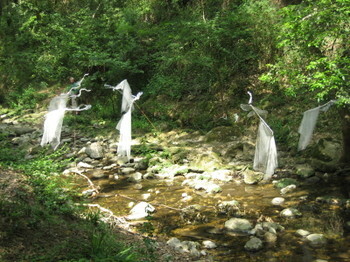 In this year’s Sentier Artistique L’Onde’Art, about 20 artists displayed their work along the popular hiking trail that follows La Brague river between the two villages of Biot and Valbonne. 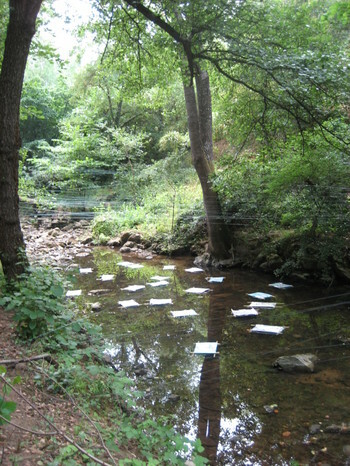 In this landscape, the artists are able to use the natural elements to enhance their works: the reflection of the water, the sunlight, the colors of nature, the rocks, the trees, the shrubbery. It was truly magical (féerique). We took the train from Antibes to Nîmes (a 3-hour trip with a connection in Marseilles), where we rented a car and headed off to Les Demeures du Ranquet on the D982 just before Tornac in the Département du Gard (30). 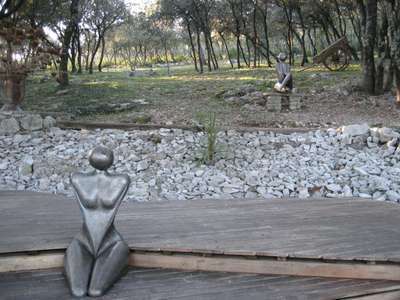 The hotel grounds were lovely, with fountains and sculptures scattered all around in a wooded area, and walkways which lead to the individual rooms, each with its own terrace with table and chairs where breakfast is served when the weather is warmer. 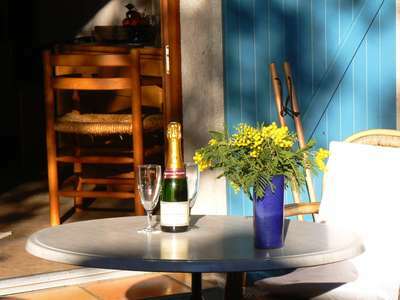 After settling into our room, which was named Cannelle (Cinnamon), we raided the room’s minibar, and indulged ourselves in a glass of champagne on our sun-filled, but chilly, terrace. 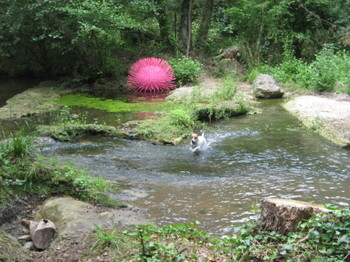 We had heard that the hotel was out in the middle of nowhere, and it was. We decided we had time for a short hike before dinner, but it wasn’t obvious where we could find the hiking trails from the hotel, although I’m certain that they do exist – maybe this just isn’t the time of year for hiking in this area. 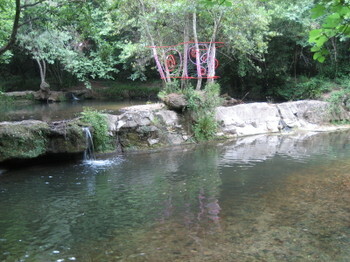 So, instead, we set out for a drive to the village of Anduze, which was only about ten minutes away by car. 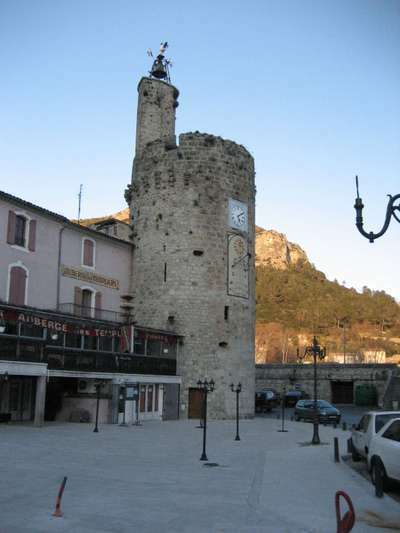 With a population of about 3,000 inhabitants, Anduze is situated in the rocky foothills of the Cévennes mountains, and serves as the Porte des Cévennes – the entrance to the Cévennes mountain range. It has been known since the 17th century for its unique pottery, in the shape of a large urn-like vase on a short pedestal base, decorated with insignias and draped garlands. Even the Sun King (Louis XIV) had orange trees planted in the Italian-style Vases d’Anduze on the grounds of the royal residence at le Château de Versailles. We returned to our hotel in time to get ready for the real reason for this trip. We came here to stay at Les Demeures du Ranquet so that we could partake in the monthly Winemaker’s Dinner served at their restaurant, “Le Ranquet”, headed by one of the few women chefs in the area, Anne Marjourel. We lucked out on this month’s dinner in the middle of truffle season, because it was also a Truffle Feast, with truffles served with every course. This month’s featured winemaker was Monsieur Thierry Hasard of Domaine de la Marfée in Murviel les Montpellier. We started the evening nibbling hors d’oeuvres and mingling with the other guests in a large reception area of the hotel surrounded by art work. 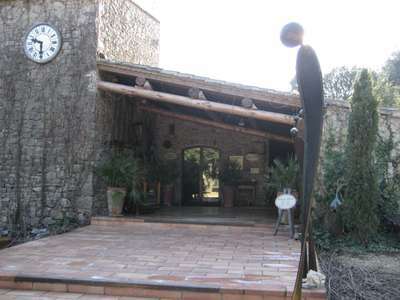 The hotel also serves as the Contemporary Art Foundation, providing temporary art exhibitions throughout the year, and sometimes organizing dinners with the artists. We felt like we were at a private party, and Jean-Luc Marjourel (the proprietor and husband of the chef) made us feel very welcome by making small talk and telling us about some of the art work. Monsieur Hasard, tonight’s winemaker, also spoke to us and explained to us how he got into the winemaking business. After hors d’oeuvres and our first wine tasting, we were seated at large tables. Our table included seven other dinner guests from the local region, who were gracious enough to engage us in conversation throughout the dinner, and were very patient with our French. Between each course, Monsieur Hasard described each wine and included many anecdotes from his winemaking experience, most of which went over our heads because his French was spoken so quickly. But, it was a very enjoyable evening, and the dinner was stupendous. It was also a long evening, with the festivities beginning at 7:45pm. When they asked us what time we would like to have breakfast delivered to our room, we didn’t realize that it was already past 1:00am. We headed east today to explore some small Italian villages in the hills above the Italian Riviera. It took about an hour on the A8 autoroute from Antibes (which turns into the A10 autostrada once you reach Italy), exiting at San Bartolomeo al Mare and following the SS 1 Aurelia for about 3 kilometers, to our first destination, Cervo, in the province of Imperia in the region of Liguria. This medieval village of about 1200 inhabitants sits atop a 66-meter high cliff overlooking the beautiful Mediterranean, which seemed a bit moody today, with a little bit of gray fog floating by once in while. The colorful 18th-century Baroque Church of San Giovanni Battista dominates all the winding, arcaded walkways and piazzas throughout the village. 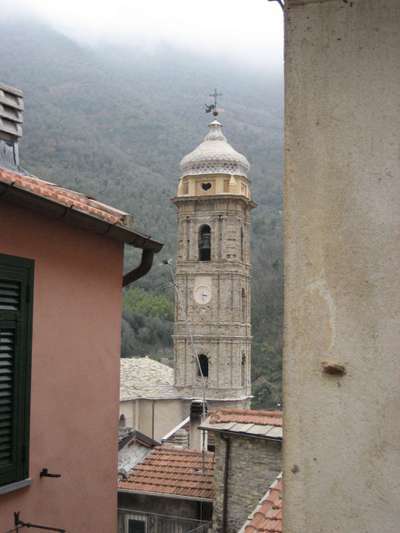 The church is sometimes referred to as Chiesa dei Corallini in reference to the fact that the church was built primarily with the offerings that the local fishermen donated from the proceeds they received from the sale of their coral. The piazza in front of this beautiful church is the venue for the Festival Internazionale di Musica da Camera (International Chamber Music Festival) held here each summer. We didn’t have a lot of choices for lunch today. Things are pretty quiet this time of year and many restaurants have their annual closures, so we didn’t get to try the Ristorante San Giorgio ( Via A. Volta 19, tel: +39.1.83.40.01.75), as we had hoped. We did, however, get a perfect table right next to the large windows overlooking the sea at Ristorante Serafino (Via Matteotti 8, tel: +39.1.83.40.81.85), where we received no menus, just an oral description of what they were offering today. We noticed that not everyone got the same offerings, but we were happy with what we ordered: a local white fish shredded and drenched in lemon juice and a flavorful local olive oil, nero di seppia (cuttlefish cooked in its ink), spagetti with shellfish, ravioli stuffed with local seafood, and everything was accompanied by a local white wine called Riviera Ligure di Ponente Vermentino 2005. The proprietor even presented me with an orchid upon our departure – maybe he was just happy to have our business during this slow time of year. After a hike just above the village of Cervo, among groves of beautiful olive trees and beautiful views, we returned to the car and headed back toward the west to our next destination in the hills above the Riviera dei Fiori (the Flower Coast), this time avoiding the autostrada in favor of the coastal road. Badalucco in the Argentina Valley is another small fortified medieval village of about 1200 inhabitants, which sits at 179 meters high along the River Argentina. From the autostrada A10, you take the Arma di Taggia exit, and continue up the valley for about 12 kilometers. It was even more quiet and deserted than Cervo today, but very interesting to stroll around. In the process of restoring the village, it has been turned into an open-air art gallery with the walls and sides of buildings displaying large murals, painted ceramics, wooden art objects, sculptures, frescoes, etc. The sunlight was diminished by clouds today, but I would love to return when the sun is bright and more conducive to viewing all the artwork along the winding pathways of the village. Maybe we’ll make a return visit in September for the Festival dello Stoccafisso (Stockfish Fair), where they pay tribute to the dried fish whose stock provided nourishment to the locals as they fought off their attackers in a 17th-century siege. Our last stop on our Italian Village Tour today, was a larger town of more than 13,000 inhabitants, which you pass on your way to Badalucco when you take the Arma di Taggia exit off of the A10 autostrada. Taggia is actually split into two parts. Along the coast is the seaside village of Arma di Taggia, while three kilometers into the Argentina Valley is the medieval village of Taggia. We only had time to visit the medieval Taggia, and not really much time for that even because it was starting to get dark. 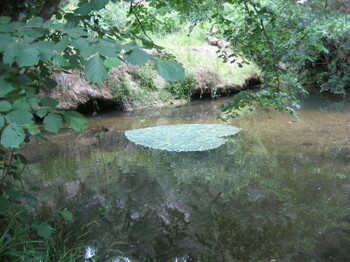 It was much livelier than the previous two villages, maybe because it was ten times larger. We only spent enough time there for a quick look around, and to pick up a few things for tonight’s dinner (bresaola with rucola, shaved pecorino, a generous drizzle of truffle oil, with a crisp white Riviera Ligure di Ponente Vermentino vino). 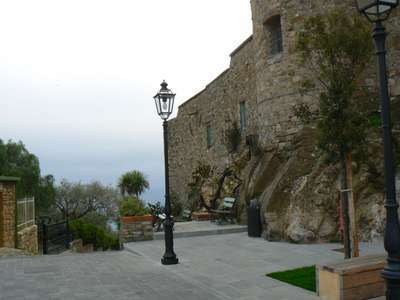 So, once again, we have to plan a return trip to do some real exploring of both the old town of Taggia and the newer seaside part of Taggia di Arma. 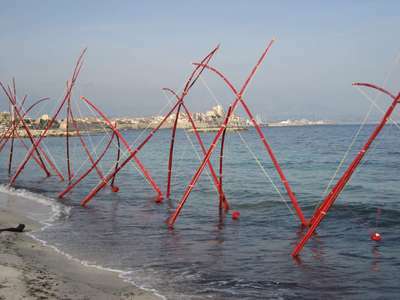 The beach is adorned with the red bamboo signature of a local artist, Bernard Abril, in the form of a sculpture at the water’s edge of Plage Salis, here in Antibes. 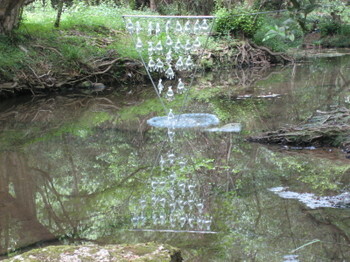 Using the landscape as his canvas and stalks of bamboo for his letters, he created his calligraphy for everyone to muse. 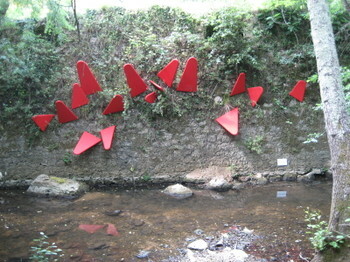 He painted the bamboo red because he wanted to add ink to his script, and also because he says that red does not exist in nature. 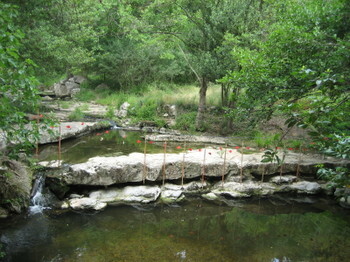 The stalks of bamboo are planted into the sand and linked together, balanced by suspended stones which are also painted red. 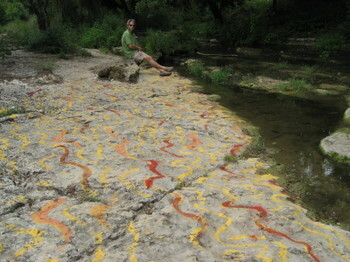 He creates his signature sculptures in different places from time to time, and each time the calligraphy is different, drawing inspiration from each unique landscape. We’re happy to be back in the beautiful sunshine of Antibes for another séjour of undetermined length. It’s almost as if we never even left, with the apartment remaining in good shape, and the car still running, and no problems encountered. 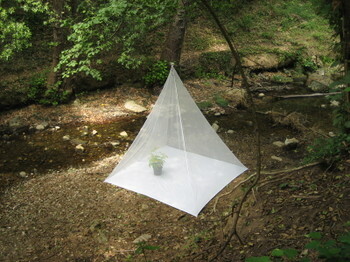 The only signs of our absence were a very full mailbox and the dead plants on the terrace. We’ve noticed a few changes in town since our departure at the end of September, such as “Maison Rober” no longer exists on rue de la République. 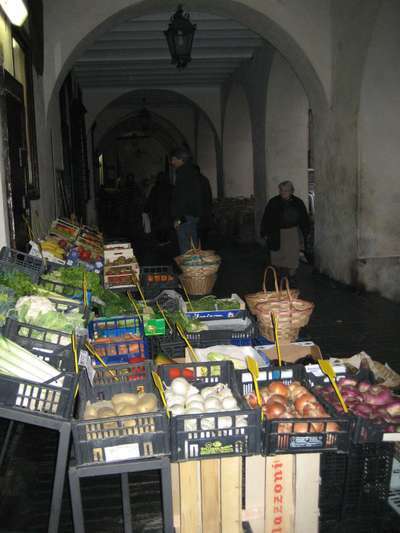 It was a small boucherie and market which has now been replaced by a small chain market called “Shopi”. Another thing I had never noticed before, and I’m assuming they are new, are the paintings near Plage Royal. 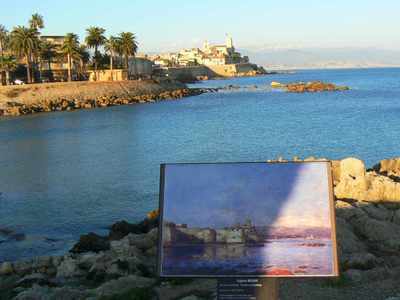 The first one, pictured above, is a reproduction of a painting called, The Harbor of Antibes (1897) by Eugene Boudin, which must have been painted from this very perspective. The other, pictured below, is a reproduction from Antibes’ Musée Peynet (Place Nationale, tél: 04.92.90.54.30) of his famous characters, “Les Amoureux” (The Lovers), of whom he drew over 6000 illustrations. 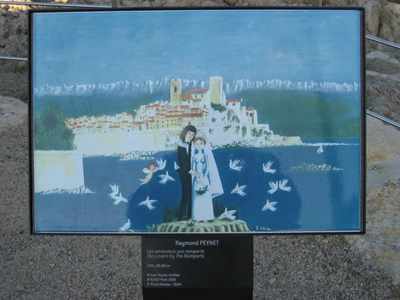 This one is called, Les Amoureux aux Remparts, which Raymond Peynet painted in 1985. “Les Amoureux” were based on Raymond Peynet himself and his beloved wife, Denise, with whom he shared his life for 60 years. This painting too could have been painted from this very perspective. On the one-hour drive in morning rush-hour traffic from Bologna to Ravenna, our GPS Navigator lead us through some NOT very picturesque roads and areas. 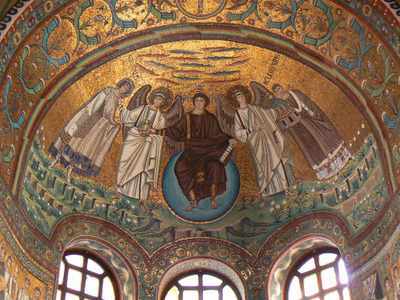 We were beginning to doubt that a day trip to Ravenna was a very good idea. But once we arrived into the historic center of the city of approximately 140,000 inhabitants, we found it to be surprisingly beautiful with its sober ecclesiastical buildings almost concealing the more beautiful dazzling riches found inside. 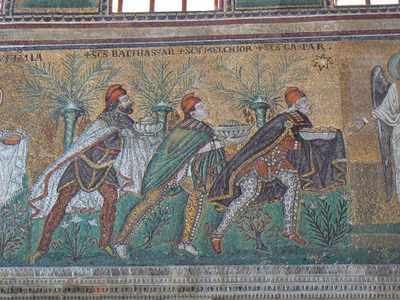 The extraordinary Christian mosaics of Ravenna from the 5th & 6th centuries and from both the Roman and Byzantine Schools are befittingly included in UNESCO’s World Heritage List. 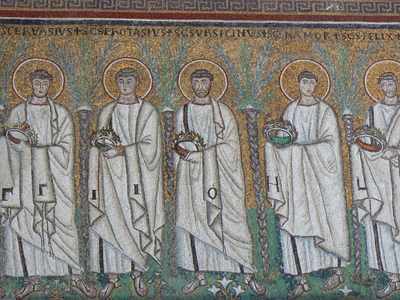 We had intended to visit only the two most well-known sites of the mosaics, the Chiesa di San Vitale and the Mausoleo di Galla Placidia. However, when we bought our 7.50€ tickets, it also included three additional sites and a small map with the path marked out to each of the sites, so we spent the afternoon searching out and exploring the Museo Arcivescovile, the Battistero Neoniano, and the Basilica di San Apollinare Nuovo; and each one seemed more impressive than the previous one. My favorite mosaics were found in the Basilica di San Apollinare Nuovo, but, actually, all of the mosaics we encountered on the Mosaic Tour were amazing. Unfortunately, these photos do not do justice to the brilliance of the colors, nor to the perspective of having these stories in tile set out all around you. 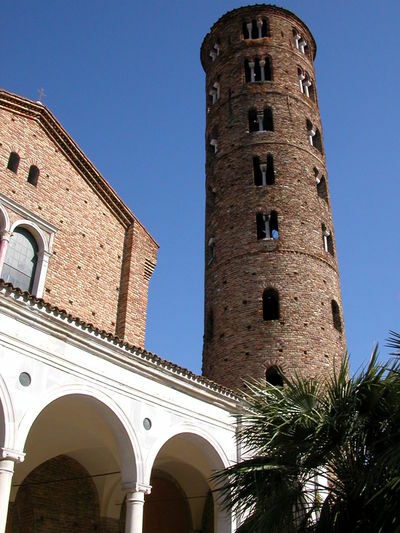 Ravenna is also one of the cities where Dante took refuge after his exile from Florence, and where he died in 1321. 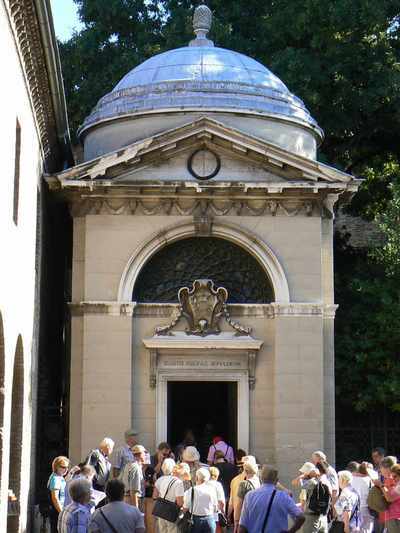 A visit to his 18th-century tomb seemed to be on every tourist’s list today. I would say that a day trip was definitely not enough time to take in everything there is in Ravenna, but we actually never really intended to go there at all. It was only when we got close to Bologna and noticed on the map that Ravenna was practically next door, that we decided to take a day to check it out. And we’re glad we did. 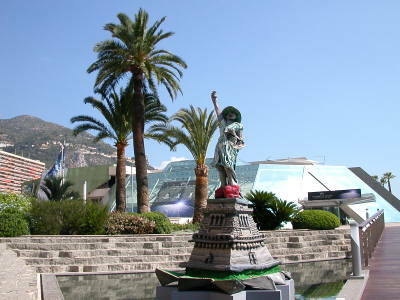 We took the train from Antibes to Monaco today, and started out at the Grimaldi Forum to see the “New York, New York” exhibition, which runs until September 10th. 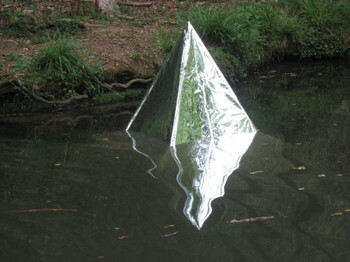 “Fifty years of Art, Architecture, Cinema, Performance, Photography and Video”. There was a lot to see, and we found a lot of it quite interesting: much of the photography, and some of the film clips, and some of the videos, such as the one of Jackson Pollock dumping and dripping paint on large canvasses on the ground and calling it art, and the video of Yoko Ono sitting on a stage while audience members came up and snipped off bits of her sweater. When we were not fascinated by it, we were sometimes repulsed by it, and sometimes we were confused by it, but we were never bored by the exhibit of 50 years of artistic creativity in the Big Apple. After lunch, we headed over to Monaco’s Port Hercule to watch the “2006 Championnat du Monde de Jet Ski Féminin”. 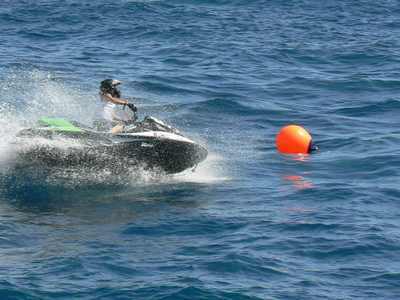 Atop their jet skis from 110 to 300 cv, the women reached speeds of 140 km/h in the Runabout category. The other two categories included Ski Division and Freestyle. And it was France who came out with the most winners this year, with 1st, 3rd, & 5th place in the Ski Division category; 1st & 2nd place in the Runabout category; and 3rd place in the Freestyle category. 1st place in the Freestyle category went to Anastasia Potanina from Russia. Dominique, Véronique, Christiane, and I drove 1½ hours to Aix-en-Provence to see the Cézanne en Provence Exposition at Musée Granet. Dominique had bought the tickets about four weeks ago, so we didn’t have to wait in line to get in. 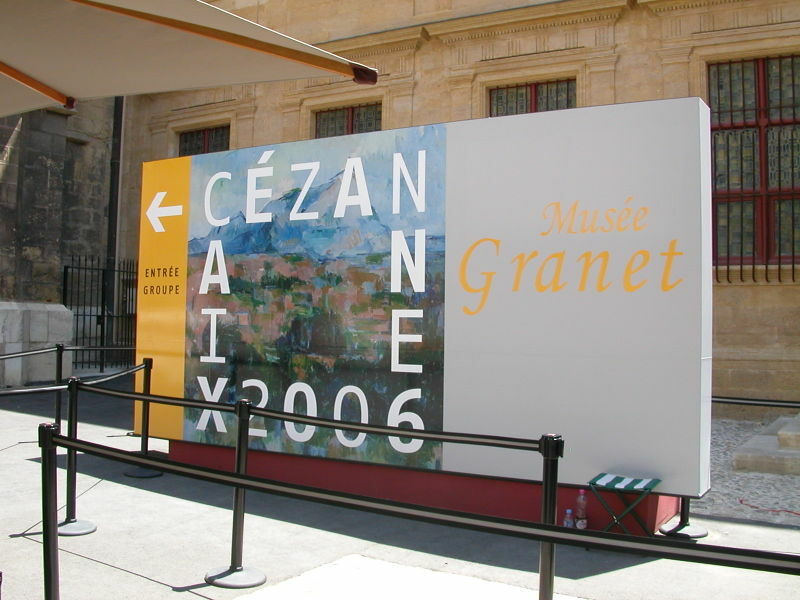 The Musée Granet has been closed to the public for over four years for renovation work. The purpose of this introductory exhibition of Cézanne is just to give us a taste of what to expect at the museum before its permanent re-opening in 2007. In this centenary year of Cézanne’s death, this particular exhibit is especially relevant, since it is in Aix-en-Provence that Cézanne was born and was deeply inspired. 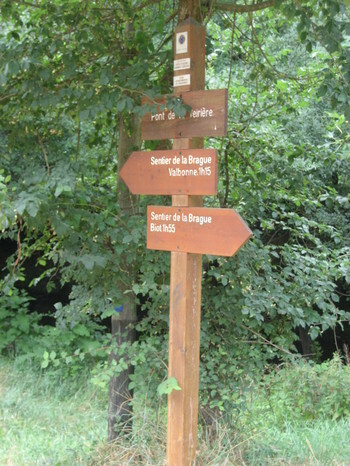 A walking tour of his associations in Aix is marked on the sidewalks with brass plaques, to allow those interested to follow in his footsteps around the city. It is enlightening to come face-to-face with many of the real-life Provençal subjects of the works displayed in Cézanne’s works, such as Jas de Bouffan, which was his family home, and, of course, the imposing Montagne Sainte-Victoire, which he painted prolifically. 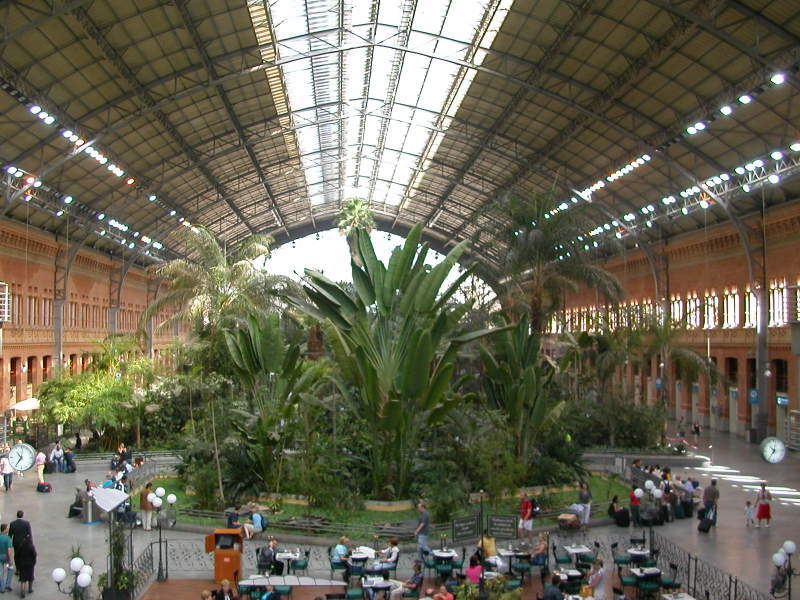 It was slow going in Madrid’s main train station this morning trying to buy our tickets to Toledo. There were no ticket machines, so we had to take a number and wait until it was displayed on an overhead LED display along with the counter number that we were expected to go to in order to speak to a real person to buy our tickets. Also, there were two number machines – one for trains leaving today, and one for trains leaving after today. When it was finally our turn to get our tickets, we had already missed the train we had planned on taking, so we had to leave on the next train, two hours later. The good news was that we had plenty of time to check out the beautiful train station, with its glass and wrought-iron structure. 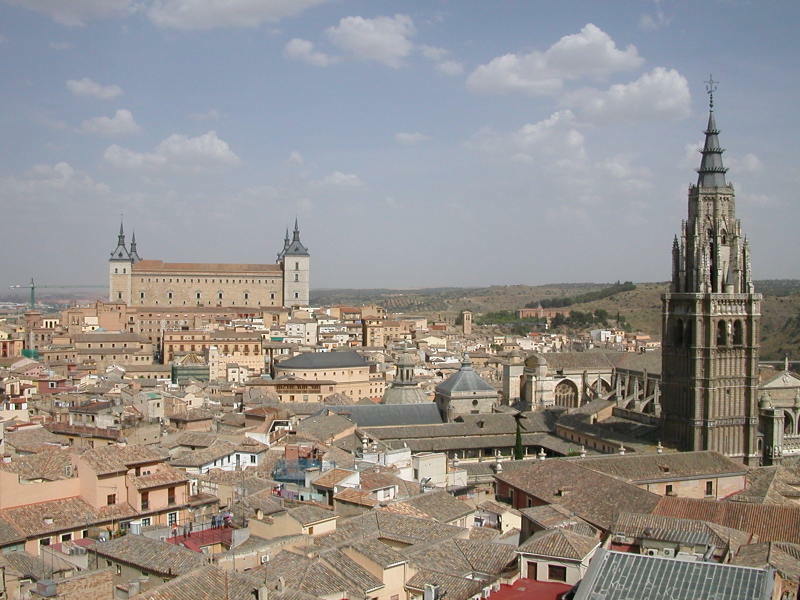 The 30-minute train ride from Madrid got us into picturesque Toledo around noon. 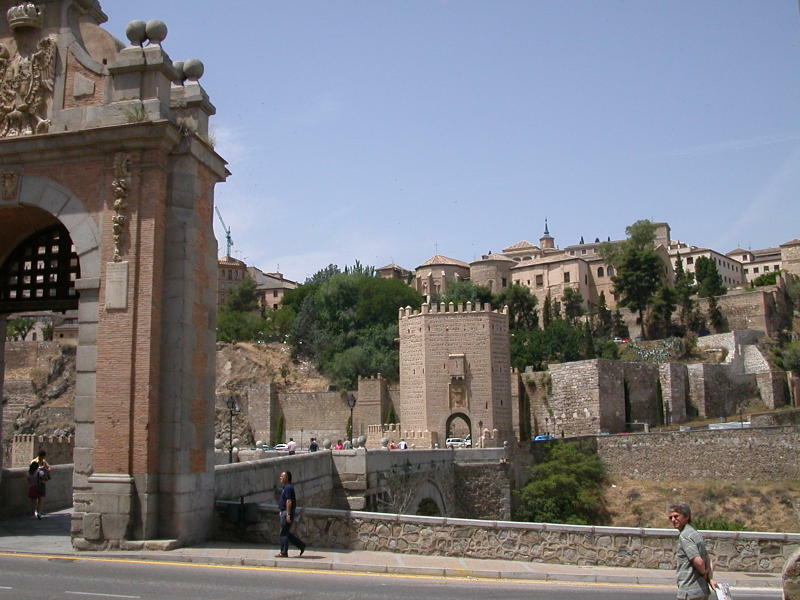 We had decided to visit Toledo on Monday because most of the museums in Madrid were closed on Mondays. It didn’t occur to us that the same would be true in Toledo. So, it was a bit disappointing that we were unable to tour the Alcázar, or visit the Casa-Museo de El Greco. However, we were able to meander through the medieval streets and appreciate the Mudéjar, Moorish, and Gothic architecture that was present at every turn. We also got to visit the resplendent Toledo Cathedral, with its extraordinary Choir depicting Old Testament Bible scenes and scenes from the Fall of Granada in 1492, and with art works by El Greco and Goya, among others. We were also lucky that the Iglesia de Santo Tomé was open, where we could admire El Greco’s masterpiece, The Burial of the Count of Orgaz, with likenesses of real people at the time, including El Greco himself. The Iglesia de los Jesuitas was also open, and it provided access to its Bell Towers where we climbed to the top to get a unique perspective of the city, with the Alcázar (in the back) and the Cathedral towering over all the rooftops. 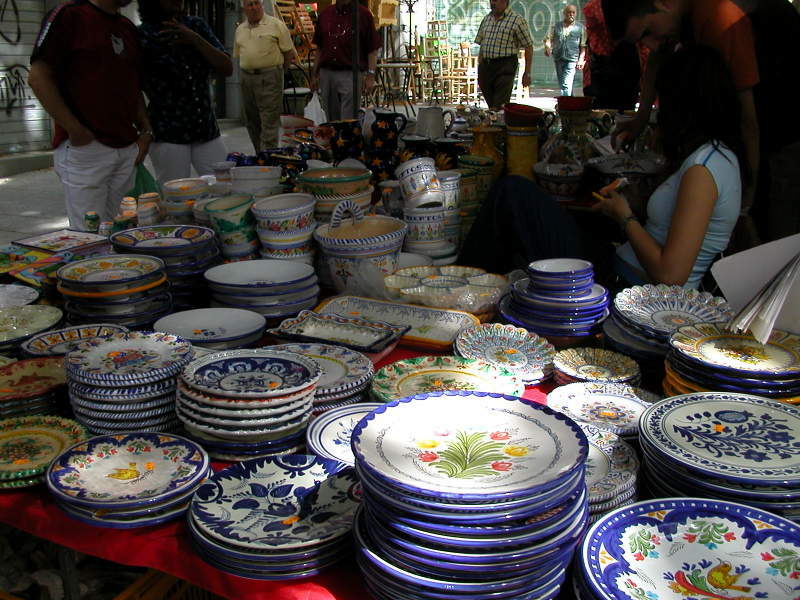 We started our day with a visit to the vast Sunday Flea Market known as El Rastro, which has been around for about the last 500 years, in one form or another. Like other markets of this type, it was colorful, lively, and elbow-to-elbow with shoppers looking for a good deal. We hit the museum circuit once again today with a visit to the Museo Thyssen-Bornemisza, the last of the “Big 3” on our list. 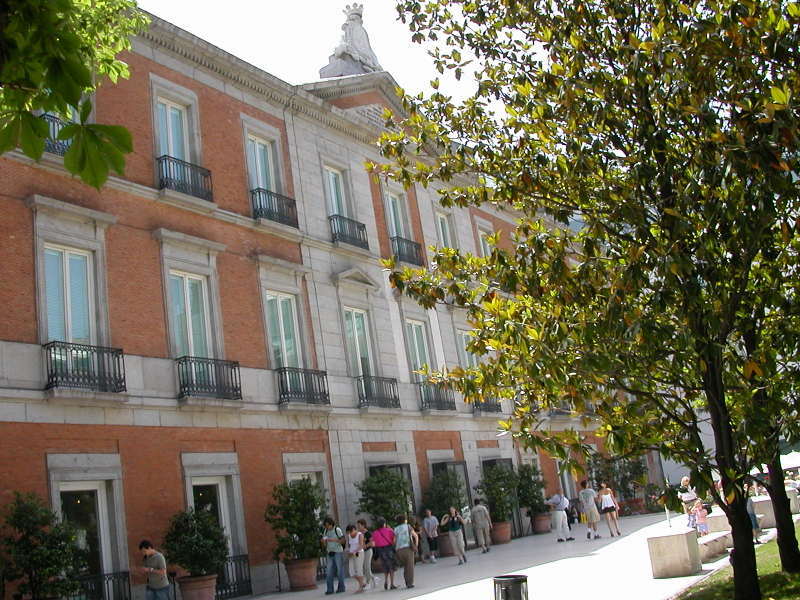 Approximately 800 works from the collection of the Thyssen-Bornemisza Family are presented in the Palace of Villahermosa. Nearly every art movement in Europe over the past 500 years seems to be represented, from Renaissance to Baroque to Rococo to Neoclassicism to Fauvism to Realism to Surrealism, etc. Some examples of what we saw include: in the area of Rococo, François Boucher’s, La Toilette; in the area of Fauvism, Maurice de Vlamnick’s, Blue Vase with Flowers; in the area of Realism, Edward Hopper’s melancholy & lonely, Hotel Room. 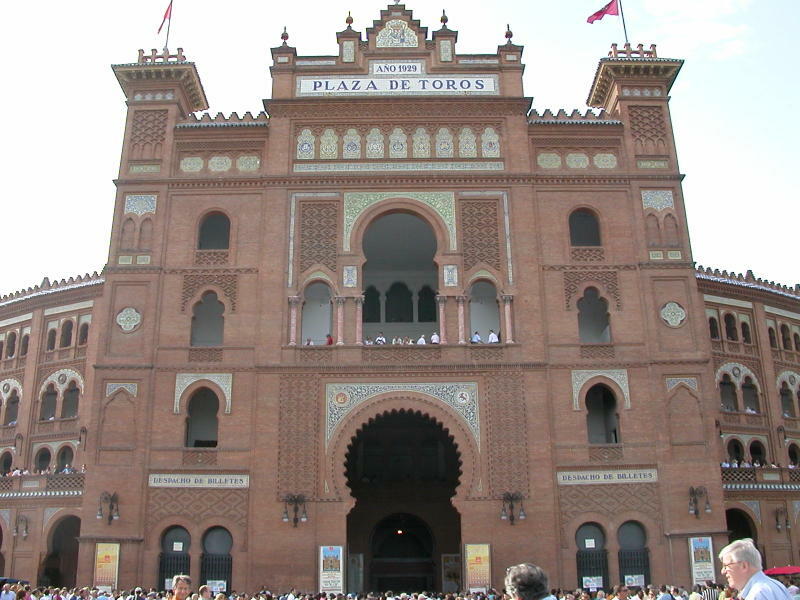 We hopped onto the Metro and disembarked at the Ventas Station to check out Madrid’s beautiful Neo-Mudéjar style bullfighting ring, and to maybe see some bulls or a bullfight. The bullfighting season runs from March to October, so we thought that maybe the timing was in our favor for getting tickets. The place was teeming with people celebrating the Feria de San Isidro, which runs from May to June, and celebrates Madrid’s patron saint, Saint Isidro. During this fiesta, there are bullfights every day and tickets can be hard to come by. We stood in line for a while, only to find out that the bullfight was completely sold out, with lots of other hopeful spectators canvassing the crowd for available tickets. I’m not sure that I was all that disappointed in missing the bullfight, but I think it could be quite fun and interesting to experience the pomp and pageantry of something so beloved by so many Spaniards.